Today’s guest post is by Virginia Knight. Virginia is a fashion historian who believes that old clothes can help us explore a better relationship with our bodies. She is a personal stylist, writer, and vintage seller based out of Asheville, North Carolina, and you can learn more about her work at her website (www.virginiacknight.com) and find her on Instagram at @virginiacknight. The year was 1939, and it was the golden age of Hollywood. Movies were escapism for Americans feeling the effects of the Great Depression and oozed glamour, most notably in their swoon-worthy costumes. 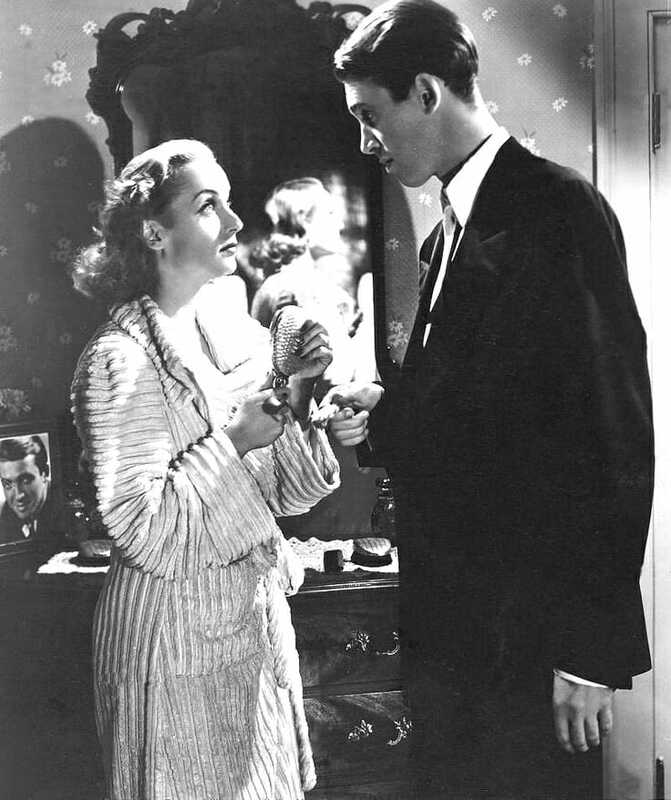 Made for Each Other (1939), starring James Stewart and Carole Lombard, is a romantic drama with a bit more of a down to earth message: the plot follows a young couple adjusting to married life. Late one night, John (Stewart) comes home from a class reunion to find Jane (Lombard) sleeping on the couch. She wakes and fixes him a late-night snack as they talk. Though not luxurious or unique, Lombard’s costume in this domestic scene is significant because of its ubiquity to 20th century women’s fashion: the chenille robe. 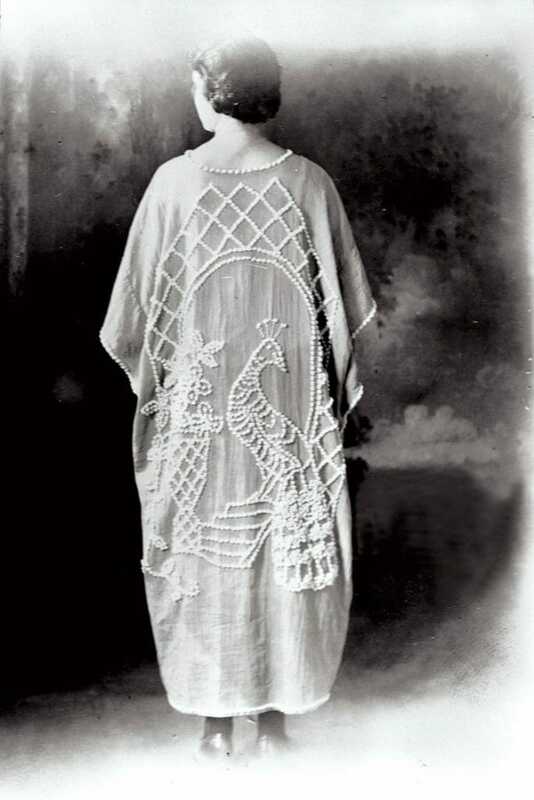 Mrs. Ralph Haney wearing a candlewick kimono with a peacock design, ca. 1920. Via Ornament Magazine. The first candlewick garments appeared on the market in the early 1920s, including candlewick kimonos. These were part of a larger fashion for Orientalism, most associated with French designer Paul Poiret, and for a particular fad for Japanese embroidered kimonos in the late 1910s and early 1920s. By the 1930s, the Great Depression had created a demand for clothing that provided a touch of glamour while still being easy to care for (and reasonably priced!). In addition, the transition from hand to machine production in the tufted textile industry increased both the speed at which these garments could be produced and the total output. Tufted coats and jackets saw a huge popularity in the years before World War II. Coats came in varying lengths and were promoted for both day and evening wear—pieces that could transition from the beach to dinner. 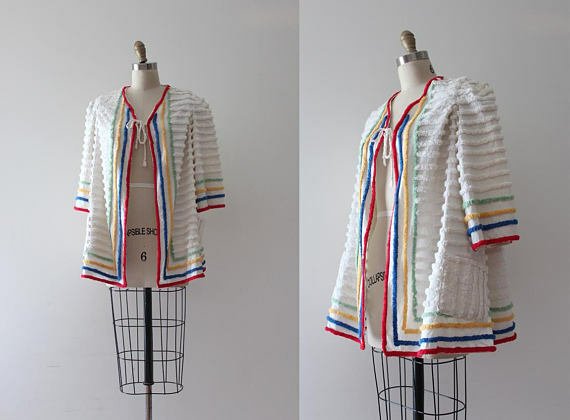 Chenille garments were ideal for casual and sportswear, and the chenille cape was the perfect accessory for a beach day. As women’s swimsuits became more revealing in the 1920s, the chenille cape provided a handy way to quickly “cover up” and preserve modesty. Like all chenille garments, capes offered fashion flexibility and were also promoted as the finishing touch over an evening gown. Chenille jackets and beachwear were in demand into the 1940s, but the United States’ entry into World War II shifted the landscape. Beachwear now had to contend with the new, dark associations of the ocean (see: German submarines and guarded coastlines). Practicality was also an issue. The chenille used for these early garments was heavy and not ideal for hot summers, especially in the South, and these garments were bulky and took up a lot of room when packing for vacation. These practical shifts would be reflected in the type of chenille garment that came to dominate the tufted market: the chenille robe. Model wearing a chenille robe by Art-Rich, circa 1953. Candlewick robes were mentioned as early as 1934 and initially had a bit of an identity crisis: people didn’t know if they should be called “candlewick” or “chenille,” if they were robes or coats, or if they were for the beach (like chenille capes and coats) or home. 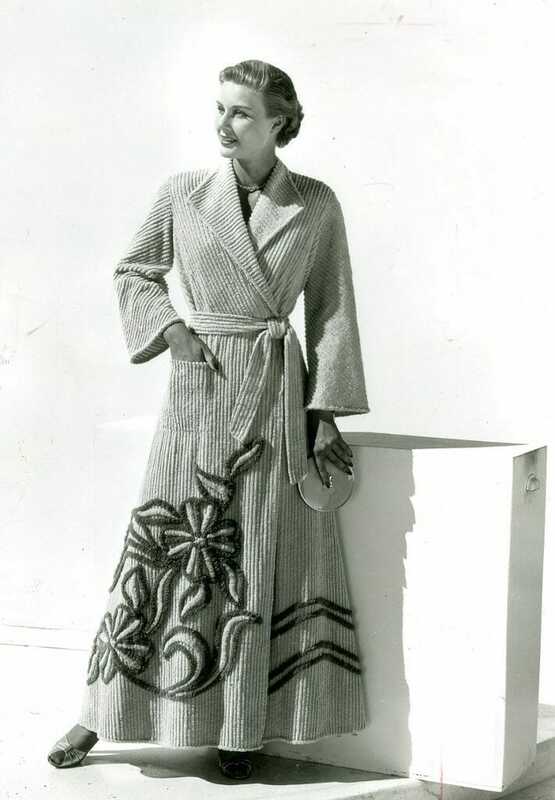 Chenille robes finally hit their stride and were marketed as a modern domestic garment - that “staple” piece of a woman’s wardrobe in late 1930s to early 1950s. Promotions of robes began suggesting that women could coordinate their robes to their home décor (such as bedspreads), and this further cemented the robe’s relationship with domestic settings. Robes were cut in a similar silhouette to fashions of the period, with a large, v neckline, padded shoulders, and a full, bias cut skirt. 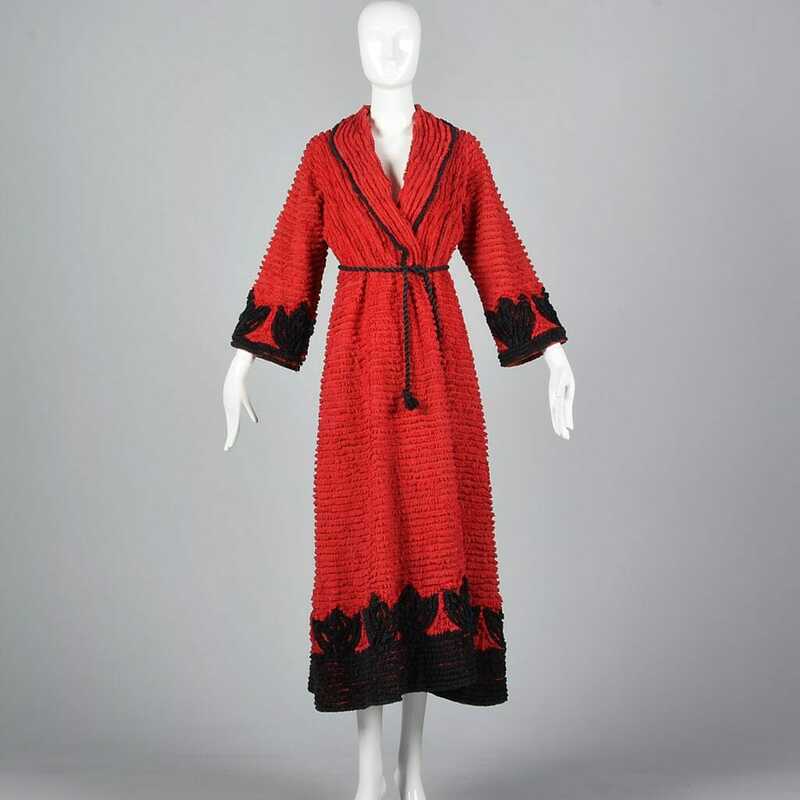 A late 1930s/ early 1940s chenille robe. From vintage seller Frock It To Me, used with the owner’s permission. Carole Lombard was not the only Hollywood star to sport this style on screen, and chenille robes benefitted from the association with glamorous Hollywood actresses. Chenille robes are seen in Only Angels Have Wings in 1939 (worn by Jean Arthur), In Name Only in 1939 (worn by Carole Lombard), Remember the Night in 1940, worn by Barbara Stanwyck, and The Ghost Breakers in 1940 (worn by Paulette Goddard). Even fashion lines coming out of Hollywood advertised chenille robes or housecoats as made and styled in Hollywood. 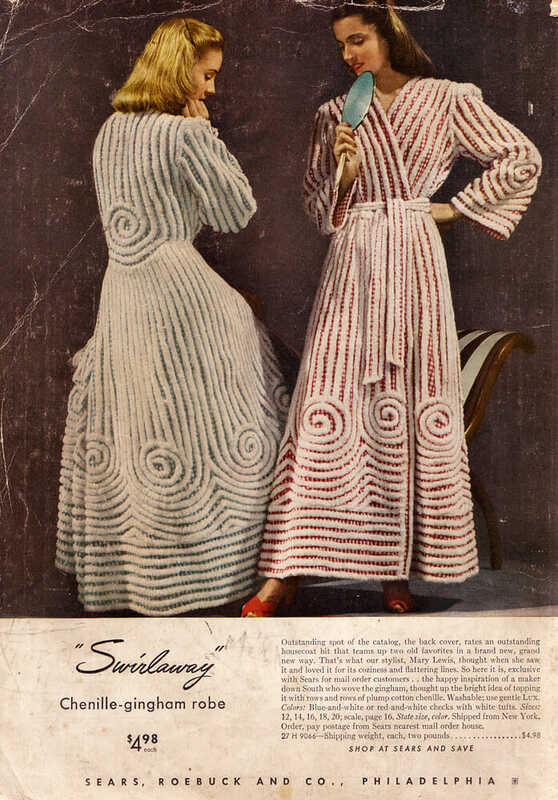 World War II affected the tufted textile industry, as it did all clothing manufacturing, but chenille robes were consistently marketing to women during the war years. The chenille robe industry continued to grow following the war and into the early 1950s. Robes shifted silhouette to reflect the feminine shape of this period (best exemplified by Dior’s New Look): waists were cinched with full skirts, and the shoulders became less pronounced. During the war, chenille robes were worn year-round because of their domestic status, but the market once again became seasonal (as in the mid to late 1930s). Chenille robes were most popular in the winter, which is unsurprising given their heavy weight. 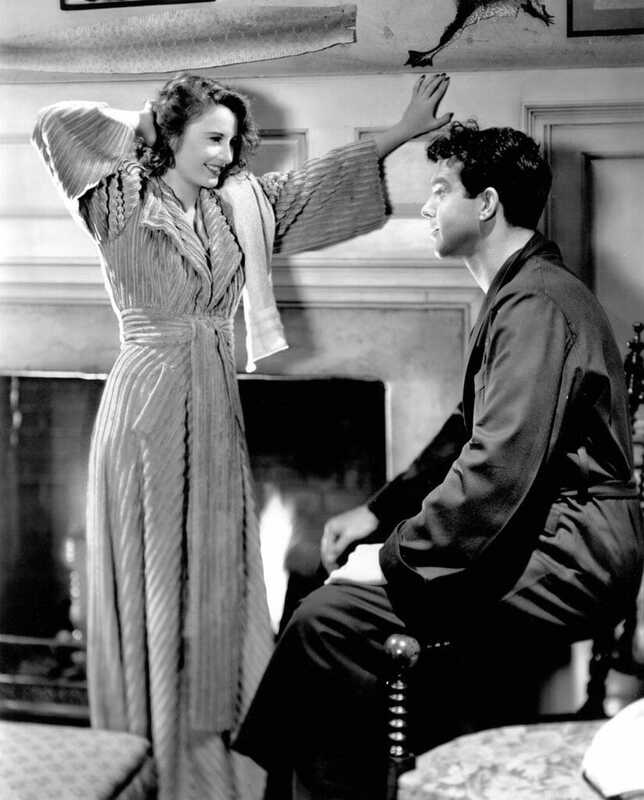 Barbara Stanwyck and Fred MacMurray in Remember the Night, 1940. Via. After its heyday in the late 1930s and 1940s, the chenille robe finally began to wane in popularity in the mid 1950s. Part of this was an industry shift, as the tufted textile industry began to focus more on carpet. What likely had more of an effect was the sentiment in popular culture that chenille robes were unfashionable. 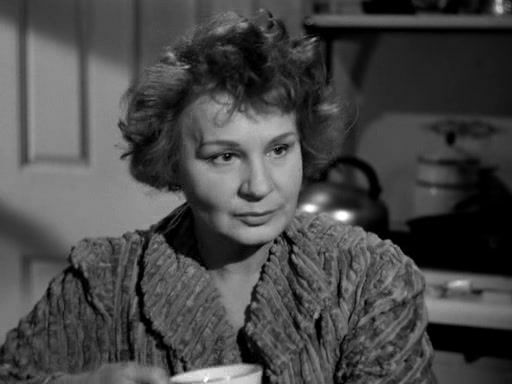 Film once again played a role here, as Shirley Booth’s character in Come Back, Little Sheba (1953) was described by critics as representing American womanhood, with her unkept hair and rumbled chenille robe. 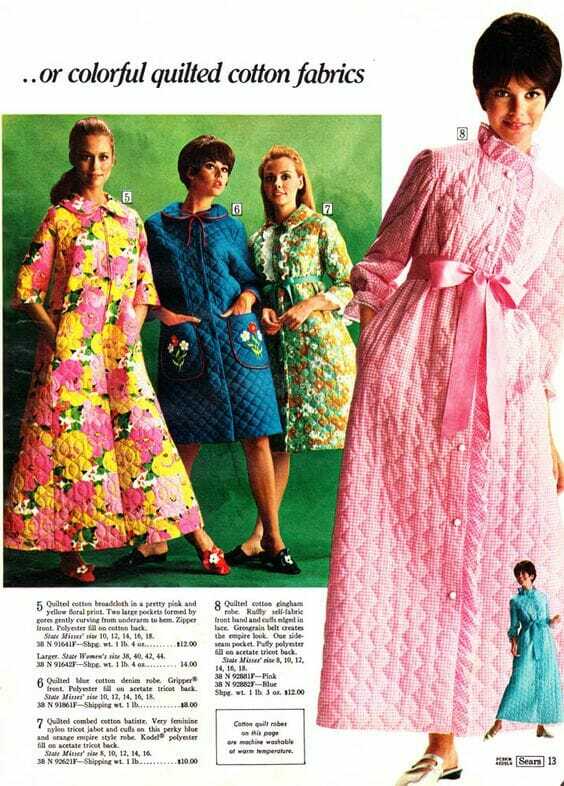 By the 1960s, the chenille robe was a quick way for comedians and pop culture figures to convey a housewife, in not a particularly flattering light. The decline of the chenille robe also makes sense when you consider the transitional period of late 1950s/early 1960s fashion. The 1960s, in a broad term, were defined by the “youthquake” that saw younger consumers driving trends. Lingerie history at this time (much like fashion) was split: older women were more loyal to the girdles and “elaborate” pieces of their youth, while younger generations embraced new brasseries and easier-to-wear undergarments. It makes sense that young people would not want to lounge around in the same loungewear styles that were popular in the 1940s. It wasn’t long, however, before enough time has passed for nostalgia to work its magic and bring about a chenille revival, starting in the 1970s. This revival included crafters, designers, and artists who incorporated old tufted pieces into new garments or products. Today chenille robes are incredibly popular in the vintage-wearing community, with robes selling for several hundred dollars on sites like eBay and Etsy. As a lover of early 20th century fashion, I’ve always appreciated the chenille robe as part of this era’s fashion landscape. But the history of the chenille robe—and the history of the industry and makers behind this style—has so many fascinating intricacies. The tufted textile industry, all the way from hand to machine garments, was driven by women, both in production and design. A modern-day Chenille robe from Natori. Chenille garments were some of the first pieces of “indoor” clothing to transition to acceptable indoor/outdoor wear. And while loungewear often reflects fashion silhouettes of the time, the chenille robe and its changing shape reminds us of the close connection between fashion trends and loungewear. More than just a grandmotherly bedspread or the outfit of a housewife, chenille and the chenille robe are an important part of American fashion history. 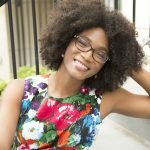 The main source for this article was Ashley Callahan’s fabulous text, Southern Tufts: The Regional Origins and National Craze for Chenille Fashion (2015), which is a must read! Other sources included Fashion Since 1900, by Valerie Mendes and Amy de la Haye and Fashion: The Twentieth Century, by François Baudot. Also recommended is Splash! A History of Swimwear (1990), by Richard Martin and Harold Koda. bravo pour ce morceau d’histoire.